Oil is a curse, it is often said, that condemns the countries producing it to an existence defined by war, corruption and enormous inequality. 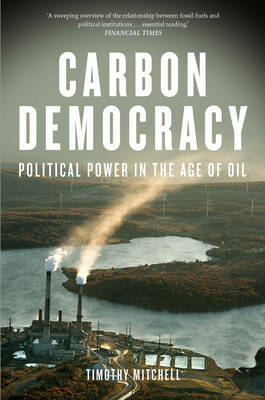 Carbon Democracy tells a more complex story, arguing that no nation escapes the political consequences of our collective dependence on oil. It shapes the body politic both in regions such as the Middle East, which rely upon revenues from oil production, and in the places that have the greatest demand for energy. Timothy Mitchell begins with the history of coal power to tell a radical new story about the rise of democracy. Coal was a source of energy so open to disruption that oligarchies in the West became vulnerable for the first time to mass demands for democracy. In the mid-twentieth century, however, the development of cheap and abundant energy from oil, most notably from the Middle East, offered a means to reduce this vulnerability to democratic pressures. The abundance of oil made it possible for the first time in history to reorganize political life around the management of something now called "the economy" and the promise of its infinite growth. The politics of the West became dependent on an undemocratic Middle East.In the twenty-first century, the oil-based forms of modern democratic politics have become unsustainable. Foreign intervention and military rule are faltering in the Middle East, while governments everywhere appear incapable of addressing the crises that threaten to end the age of carbon democracy - the disappearance of cheap energy and the carbon-fuelled collapse of the ecological order. In making the production of energy the central force shaping the democratic age, Carbon Democracy rethinks the history of energy, the politics of nature, the theory of democracy, and the place of the Middle East in our common world.